Where will the I-69 system be located? The I-69 system in Texas will be located primarily along the existing footprints of portions of US 59, US 77, US 84, US 281, State Highway 44 and State Highway 550. In some locations, it may be more preferable to build the interstate highway on new location to avoid significantly impacting a town or community. When complete, the I-69 system in Texas will be approximately 1,100 miles long. How will the I-69 system help my community? Emergency Evacuation - An interstate would provide additional lanes and capacity for emergency evacuations such as hurricanes. Improved Safety - An interstate highway has safety features that undivided 2 and 4-lane highways do not have such as overpasses at crossroads, entrance and exits ramps, and shoulders. Economic Development - An interstate may also increase economic development because convenient interstate access is a factor when businesses undergo site selection. When will the I-69 system be built? The I-69 system is currently being built in a series of small, local-level projects. These projects include upgrading existing highway sections to interstate standards or building relief routes around towns at new locations. Currently, there is no specifically dedicated funding to build the I-69 system in its entirety. To date, approximately 161 miles of the system have been designated as interstate. 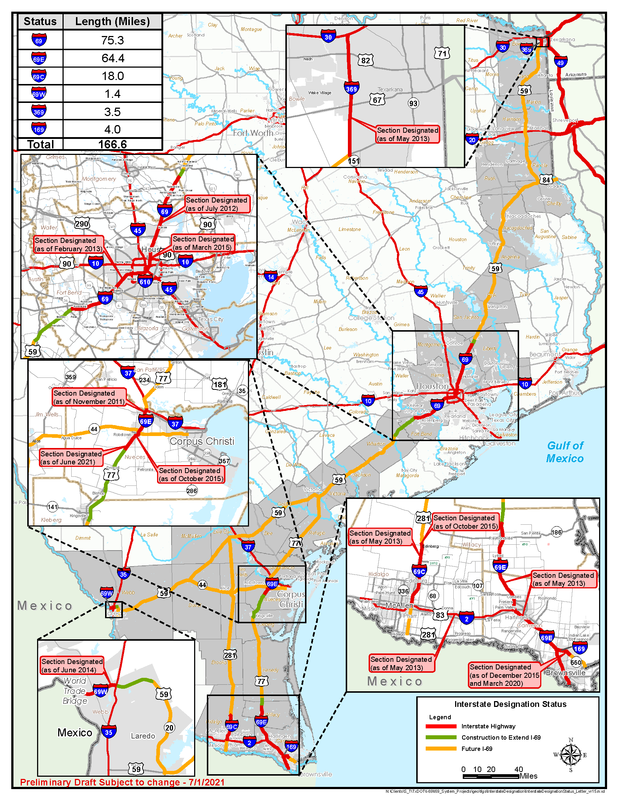 Please refer to the February 2018 I-69 Implementation Strategy Update report on this website, which shows the status of I-69 system development in Texas. Will the I-69 system require right of way from my home or business? The segment and advisory committees stressed that TxDOT should keep road improvements for I-69 within and along existing highway right of way to the greatest extent possible. However, a project may require new right of way from residential property, businesses, farms and ranches in order to meet interstate standards. The public will have the opportunity to review and comment on specific project plans for developing the I-69 system when TxDOT undertakes a planning or environmental study. If a project requires right of way from my private property, how will I be compensated?